Deter thieves by quickly neutralising sophisticated burglary tools: Chubbsafes' vaults and vault doors ensure your strong rooms are protected to the highest level. Thieves have targeted vaults with a variety of sophisticated tools. 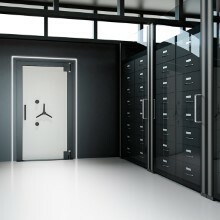 As a result, vaults have evolved with an advanced array of anti-theft devices, including highly secure vault doors, alarms, combination dials and more. The Chubbsafes' range of vaults and vault doors offers certified protection against attacks from a variety of sources: crowbars, high-powered disc cutters and oxyacetylene torches, explosives, diamond-core drill bits and more.